How do I refine a search in the U.S. Congressional Documents? A Congress Member’s name, a word or phrase, or even a rollcall vote could get several hits in the database on any given search across the U.S. Congressional Documents collection in HeinOnline. Therefore, it is recommended that you refine your search as much as possible in order to receive the most relevant results. You can refine your search in several ways. Add a date range: Enter a begin and end year using the date fields below the title listing. 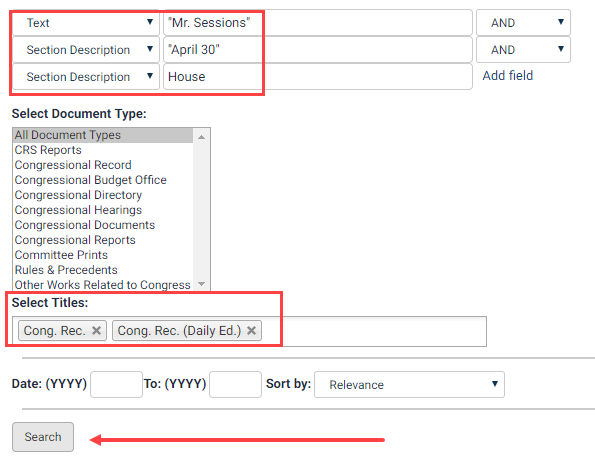 NOTE: When searching in the Congressional Record (Bound and/or Daily) and the Congressional Globe, you can also add a day, such as April 30, in the Section Description field. Add a section: Look in a specific section by entering “Senate”, “House”, “Extension” or “Daily” in the Section Description field. To determine what other section descriptions may be available to search, open a volume and click on the table of contents. The text that is italicized in a section title is considered the “section description”. Some other examples include: index; proceedings and debates; appendix, title page, notes, and journals of congress to name a few. I have a Congressional Record citation. Is there a way to use that citation to find what I need? Can I search in a foreign language in IFLP? What is the difference between the two search options, Search IFLP Metadata and Search IFLP Print Edition?